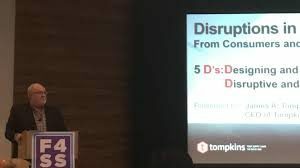 Blog / Insights / F4SS Connect 2019, the “Disruption Conference,” a Huge Success. The supply chain is massive. Every single product produced can be linked back to a supply chain in one way or another. But our niche in this enormous arena is surprisingly small. We either know each other, know of each other, or have worked together as colleagues. We know this industry. The F4SS Connect give us a place to come together to meet, reconnect, network, share best practices and industry trends …. and to learn, together, from always-relevant speakers. The F4SS Connect 2019, held in Ft. Lauderdale, explored the theme of Disruptions in the Value Chain: From Consumers and Retailers Through Suppliers. Approximately 100 attendees shared 3 days with F4SS to attend this event. Away from their offices and their families. Why? It wasn’t only because the event was in Ft. Lauderdale in February! It’s because the event is time well-spent. 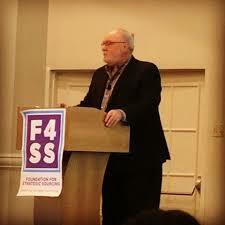 Click here to download Tompkins’ presentation, as well as the audio and video from his talk. Much like the speakers we heard from at F4SS Connect 2017 that said we need to learn about Blockchain, this is an issue that cannot be ignored. Save the date for F4SS Fall Connect 2019, to be held in Minneapolis from September 16-18, 2019. We’ll explore the theme of Supply Chain Transformation. This time we’re headed to Minneapolis, the home of the supply chain giants.